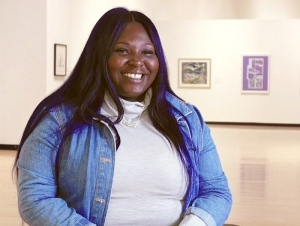 Lavonnie Green, a senior childhood education major from New York City, chose Buffalo State sight-unseen when she was a high school senior. Green definitely had additional hardships besides economics to contend with. Her father died when she was in the fourth grade; when she was just 15 years old, her mother suddenly passed away. Green’s sister, who was 21 years old at the time of their mother’s death, took care of Green for the remainder of high school. Those same dedicated teachers inspired Green to pursue a career in elementary education. She added an extension to teach math in grades seven through nine. “To me, it’s not just standing in front of a class and teaching a subject,” she said. “It’s connecting with students. You are often with the kids more than their parents are." Along with working alongside teachers in the Buffalo Public Schools, Green has had the opportunity to teach children in Zambia, South Africa. She spent almost three weeks there last summer through Buffalo State’s International Professional Development Schools (IPDS). When Green has her own classroom someday, she hopes to motivate students to love learning just as much. For now, Green is excelling in her academic classes and classroom immersion in public school classrooms. She also has emerged as a leader in Black Active Minds (BAM). She’s currently the vice president of the campus organization that facilitates discussions on several topics, including the social, economic, and political issues that affect minorities on a global scale. Through BAM, she said she’s met people from different organizations and backgrounds. BAM also dovetails nicely with Green’s love for teaching.